The Green Energy Act (Act) didn’t just happen—it was created by the Green Energy Act Alliance or GEAA. The 3rd Anniversay of the Act just passed so this article will take a look at; how the Act came about and the effect it has had on the Province. A visit to the MaRS Discovery District to view some of the videos resident on that site by the list of people on the attached chart will quickly show many of the individuals involved in the GEEA claim responsibility for bringing the Act to fruition. As one example, Marion Fraser is almost beside herself with delight about her role in its creation. The GEAA inundated the Ontario Liberal Majority government with material and lobbying efforts from the time the McGuinty government were first elected until they successfully got Energy and Infrastructure Minister, George Smitherman, to buy into their concepts. “Finally, we believe that one of the most significant features of the act is that it will create jobs—tens of thousands, hundreds of thousands of jobs. The proposed act and the relevant regulations have the potential to enable the greatest number of meaningful jobs, more than the OPA’s previous plan, and those jobs can start today. Renewables and conservation are shovels in the ground today—and we need the jobs today. We, too, have commissioned a study, with the Political Economy Research Institute of the University of Massachusetts. Preliminary results shows that aggressive implementation of the Green Energy and Green Economy Act, the feed-in tariff program and related regulations will produce three times the number of jobs than what the IPSP had originally proposed. The government estimates of job creation of 50,000 are likely to significantly understate the potential. Just as importantly, jobs from conservation and green power occur across the province and a greater proportion of those jobs are ongoing. Distributed generation and conservation means distributed local jobs—and yes, I’m going to use the Germany analogy, much to the ministers chagrin, if he were here to stay for this. As the reader will discern, Ms. Doncaster, a little over three years ago, was forecasting “hundreds of thousands of jobs.” would be created by the Act while citing the German example and boldly stated that Ontario’s “energy plan was superior to Germany’s”. This presentation and numerous studies, including the one mentioned in her presentation were regular occurrences, leading up to the presentation of the Act in the Ontario Legislature. It is worth reflecting on whether those studies were partially financed by the taxpayers of the Province bearing in mind the list of sponsors of the GEAA. Those sponsors include six (6) of the GEAA Founders (refer attached chart), many of whom were adept at obtaining grants from publicly owned institutions like the Trillium Foundation, Friends of the Greenbelt, Toronto Atmospheric Fund, etc., etc. The Founders of the GEAA were originally listed on a 7 page paper titled; “Creating a Green Energy Act before Copenhagen 2009”, that seems to have been created by Kris Stevens of the Ontario Sustainable Energy Association (OSEA) on November 3, 2008. This paper forecast 215,000 jobs , 200,000 trained workers and cites the German and Spanish experience. The paper omitted listing the World Wildlife Fund as a founder but they were subsequently added. Yet another study released in February 2009 by Toronto Region Conservation Authority (TRAC where David Love is Executive Director) in conjunction with York University’s Faculty of Environmental Studies (FES) noted the jobs Ontario had lost (230,000 manufacturing jobs) and suggested the way forward was renewable energy as the highest job creator! Spain and Germany were again noted as examples of how they created jobs from their adoption of renewable energy generation. This report went on to outline the biographies of the interviewees (16) of whom many were connected to the GEAA including Jose Etcheverry, Assistant Professor in the York FES as well as the Chair of the GEAA, Deborah Doncaster, Brent Kopperson of Windfall Ecology Centre and Kris Stevens of OSEA. It should be noted that York’s FES are also adept at tapping into public funds as an October 2011 newsletter tells all about $3 million in grants received and mentions several familiar names involved in the environmental movement. Assistant Professor Etcheverry honed his skills at the David Suzuki Foundation before joining York University and it appears he has launched the “Sustainable Energy Initiative” (SEI) under the banner of the FES enlisting Mark Windfield (formerly with Pembina [a GEAA founder] and the Canadian Institute for Environmental Law & Policy) as a Co-Chair along with Peter Love (formerly Ontario’s Chief Conservation Officer with the Ontario Power Authority) and Tyler Hamilton, “editor-in-chief of Corporate Knights and the Toronto Star’s clean energy and technology columnist. The focus of the SEI appears to be to get students to drink the renewable energy kool-aid. SEI’s partners include TRAC (see above), Windfall Ecology Centre where Brent Kopperson is listed as founder and Executive Director. Kopperson was one of the drivers of the GEAA (refer chart). Windfall is very effective at tapping into publicly owned entities as this link will show. 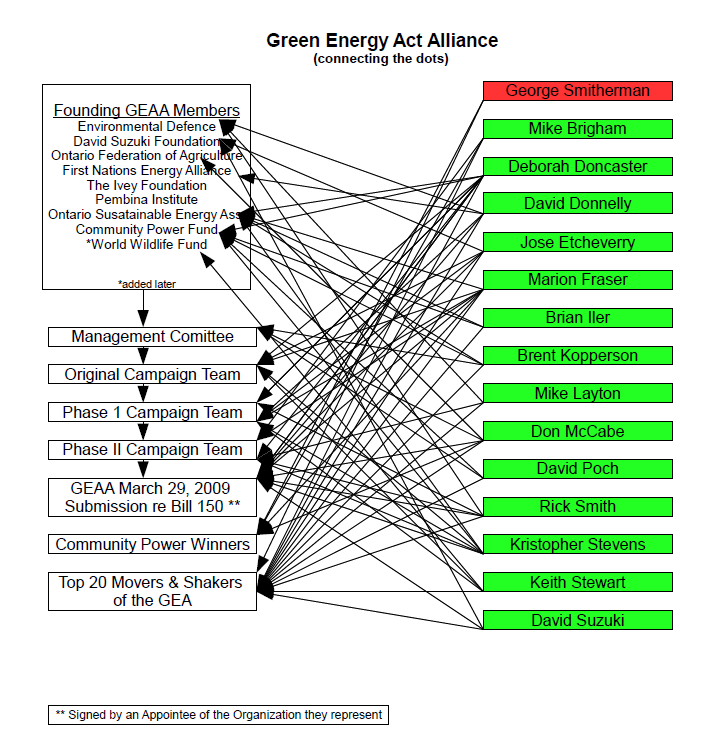 The list of the main individuals involved and listed on the chart fails to include a few luminaries involved in the GEAA. An expanded list would include Paul Gipe, a US based IWT supporter for decades, Bruce Lourie of Ivey Foundation, Tim Weis of Pembina, Gideon Forman of the Canadian Association of Physicians for the Environment, Jack Gibbons of the Ontario Clean Air Alliance. Those on the list are the ones most connected and recognized in the halls of Queens Park working to create the Act. They were included in the November 3, 2008 paper and included in the GEAA’s list of the Management Committee and the Phase 1 and Phase II Campaign Teams. We have also cross listed them with Tom Rand’s list of the “Top 20 Movers and Shakers of the Green Energy Act as picked by Tom Rand after consultation with seven (7) people and with the signatories on a March 29, 2009 paper that sought to amend the original Bill 150. The message above from George Smitherman, the then Deputy Premier, signaled his full belief in the messages that the GEAA pumped out in the form of their studies and papers. Three years later it is obvious that the messages delivered to the ruling Liberal party weren’t worth the paper they were printed on. The Act has done absolutely nothing to curb the decreasing manufacturing employment in the Province and nothing to clean the air. The poster children of those who were active in the GEAA in the form of Spain, Denmark and Germany have also fallen on hard times and it now appears Germany may be on the verge of ridding itself of subsidies that support solar and wind generation. According to Spiegel Online “Bankruptcies Have German Solar on the Ropes” creating massive job losses as government subsidies are reduced. A recent study by the German Energy Agency (dena) estimates that Germany will require backup fossil fuel plants for renewable energy equivalent to 60% to ensure security of supply. They also forecast that electricity rates will continue their climb (presently German electricity rates are the 2nd highest in Europe after Denmark) much like Ontario where electricity rates are forecast to be the highest in North America. But didn’t the GEAA members tell us that the Act would create “hundreds of thousands of jobs” and produce electricity at lower rates then new gas or nuclear generation units and didn’t they promise us clean air (so far Ontario has had the 3rd highest number of smog days in 2012 since record keeping began in 1995)? Did the McGuinty Liberal government simply take the words of these 14 plus individuals and not consult with anyone who might deign to disagree or even to examine the facts presented in the papers and presentations? Most of these environmental not-for profits and charities that formed the GEAA are now using the same information to tell us that noise from industrial wind turbines (IWTs) is not harmful to humans and that more birds are killed flying into buildings then by IWTs and the Liberals seem to accept their musings, staying the Acts course. When will sanity return to those we elect to manage the affairs of this province? The taxpayers and ratepayers of this province don’t want or deserve another Liberal majority government that panders to the beliefs of a few and fail to do proper cost/benefit analysis that reflects the lack of economic and health aspects of the Act! In this writer’s humble opinion the cure for the ills caused by the McGuinty Liberals will take far more time then the 9 years they have been in power and the legacy left by the Liberals will be decades of austerity and high electricity prices. Obviously this whole GEA is a “huge scam” yet continues to be carried out against so many documented and scientifically validated reports that some days it’s just difficult to decide which one is more poignant than the next. We are being robbed, embezzled, and basically forced into virtual bankruptcy by an out of control, rogue Government. This should be enough of a basis for a Public Inquiry IF there were any regulatory agencies left in this Province that stood on the side of those who are financing this scam…………..the PEOPLE. Apparently there isn’t!